Sometimes its about staples. Not the bold print, the cutting hemline, its about the perfect base that fits beautifully, and never lets you down. 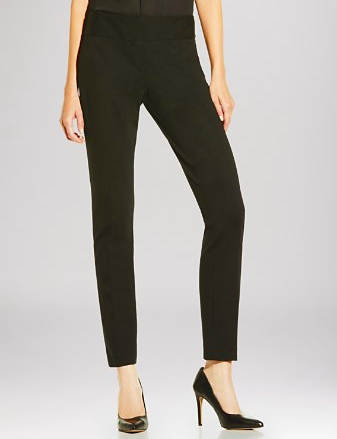 Today that is the black ankle pant. Not a legging, not a jean, a fitted, structured, black ankle pant. 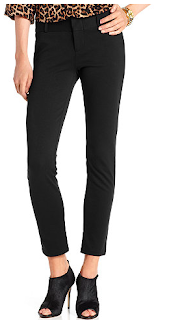 It's not shocking that Vince Camuto makes a stunning pair of black pants. This pair is simple perfection. Look at these great long lines. Clean and simple. You don't have to spend a bundle to get a great pair of pants. I love Old Navy pixie pants. A little bit of ponte adds the perfect amount of stretch with structure. While I love talking about dots, stripes, florals, and color blocking, sometimes you just need a great pair of black pants. These four won't do you wrong.